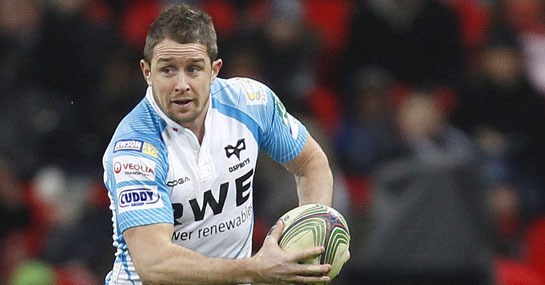 Cardiff Blues’ Heineken Cup campaign could not have got off to a better start. The capital side have been in sparkling form and have won all three of their Pool 2 games so far to open up a three point lead at the top over second place Edinburgh. Meanwhile, the Ospreys continue to underachieve on the European stage and have just one win from their opening three games. The Blues turned over the Scots 25-8 in their previous meeting last week and dismissed them 38-15 in their league meeting at Murrayfield back in September. Although it should be a much closer encounter this time out, it’s hard to see a different result. Edinburgh will be without Ben Cairns, Andrew Kelly and Alan MacDonald for the clash, while the Blues are missing flanker Martyn Williams with a broken arm. However, the Blues could give a debut to Gavin Henson who has been out of action since injuring his wrist playing for Wales against England in the summer. The Blues have been throwing the ball around brilliantly so far in the competition and, with the Welsh side scoring at least 24 points in each of their victories against London Irish, Racing Metro and Edinburgh, backing the Welsh side to win with a one point handicap looks very tempting at 10/11. The Saracens won the first encounter between these sides 31-26 last week but the Ospreys look good to get their revenge this Friday. The Welsh region will be without Nikki Walker, Gareth Owen, James Goode and Alun Wyn Jones for the game but with the likes of Shane Williams and Tommy Bowe poised to start, they will be a tough test for the Saracens on home soil. The Saracens have won two of the previous three meetings between the sides though and are current Pool 5 leaders so, ignore the handicap market, and back the Ospreys for a straight win at 8/15.